I have been told by hundreds of DBAs that I have the best DBA job in the world as Director of DBA Education for Red Gate Software. And this has been very true. In the five plus years I have been with Red Gate I have traveled over 500,000 miles (breaking the million mile record on my frequent flyer program), slept in hotel rooms for just over 450 days, and given 154 presentations to over 10,300 people in six different countries. I have written four books, hundreds of blog posts and articles, and personally met thousands of DBAs. My face has been on millions of banner ads impressions, posters, and books, and of course, last year I had the most unusual experience of my life when I “starred” in a the DBA in Space videos. Being filmed by a professional film crew and working with a real actress will probably be the most unusual thing I will have ever done in my life. The last five plus years with Red Gate has been a wonderful ride, and a great opportunity to participate as an active member of the SQL Server family. Reprinted from my editorial in the Simple-Talk Newsletter. It’s hard to believe, but it was five years ago that Red Gate Software started sponsoring the Exceptional DBA of the Year Awards. The award, which was inspired by my book: How to Become an Exceptional DBA, has uncovered a number of DBAs who might otherwise not have ever been publically recognized for their skills as master DBAs. Reprinted from my Database Weekly editorial. Forget what you thought you knew about SQL Server certification, as Microsoft has completely redesigned the SQL Server 2012 certification program, making is more difficult, costly, and time-consuming to attain. In addition, whether you like it or not, not only will you need to know how to administer SQL Server (which is of course fully expected), you will also have to become familiar with how SQL Server interacts with the Cloud (Microsoft’s Cloud) and Data Warehousing. If you are not up on the Cloud or Data Warehousing, you will have a lot of preparation work ahead of you. The new exams will become available starting in June 2012. I was just at SQLRally in Dallas, and I was speaking to a DBA friend of mine over lunch. He made the comment that his manager thought he spent too much time at work taking care of the organization’s data. He told me that he spent so much time at his job because he wanted to ensure that the data was properly cared for. Now that is what I call an exceptional DBA. Here is a DBA that thinks protecting the organization’s data is more important than does his manager. And on top of this, this particular DBA donates a lot of his free time to the SQL Serve community. When I asked why he spent so much time helping out with the community, he said it was to help pay back for all of the help he had received from the SQL Server community over the years. What a DBA! It is exceptional DBAs like this who need to be recognized by their peers, and they can by entering the 2012 Exceptional DBA of the Year Awards. These awards are hosted by SQLServerCentral.com, and sponsored by Red Gate Software. If you think you are an exceptional DBA, you can nominate yourself for the award. Or if you know of an exceptional DBA, you can nominate them. Either way, to be recognized as an exceptional DBA, you must enter. Once you are nominated (by yourself or another), your application will be reviewed by four judges: Steve Jones, Grant Fritchey, Rodney Landrum, and Brad McGehee. The judges will then select five finalists. Then these five finalists will be voted on by the SQL Server community, and the judges, to select the 2012 Exceptional DBA of the Year Award. A license for the SQL DBA Bundle with 36 months of support and upgrades. For more information on the award, and to nominate yourself or another, check out www.exceptionaldba.com. In the April 2012 Question of the Month, I asked readers to tell me their favorite DBA books. I have compiled the results, and below are the most popular books my blog’s readers picked. If you are looking for a good SQL Server book to learn from, then you might want to consider reading one or more of them. Click on the image to find out more about the book. When Will You Upgrade to SQL Server 2012? This is a reprint from my editorial in Database Weekly. Also, check out the May Question of the Month, as it is also directly related to this topic. Often when I speak at user groups and conferences, I ask attendees what versions of SQL Server they are running. As you may expect, I hear from attendees who are running the entire gamut of SQL Server versions, from SQL Server 6.5 up to SQL Server 2012. 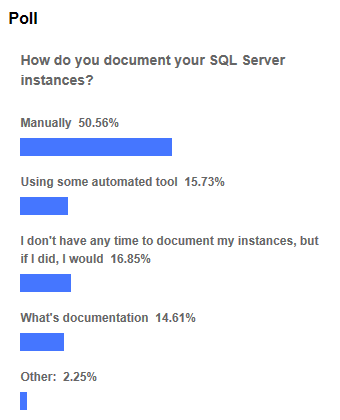 While it is an unscientific poll, it seems that most people are still running SQL Server 2005 and SQL Server 2008.